The main positive for voting no is not paying more taxes and thus having more money in my pocket to spend as I wish. That said, I intend to vote yes. That said, I intend to vote yes. I agree with this. I’ve grumbled, a lot, about how Metro and Sound Transit are treating (or not) the Central District of Seattle. I’ve had my say and my point of view didn’t win. But I will vote yes. Why? Voting no doesn’t get me, or the region, “nothing,” it gets us less than nothing. More years of wondering, planning, debating, and–most importantly–not building. Voting yes gets more transit in our system. I’m sure everyone can find at least one quibble in a map as complicated and varied as this one, but it still connects areas that weren’t connected and moves more people than are moved now. And, ultimately, if we really believe in the idea of a car-less or car-lesser future, this is one way to do it. Who knows? Sound Transit 3 could be such an overwhelming success that we get even more inspired and Seattle finally wins the tax ability it needs to build a dense, in-city network That could happen and it’s vastly more probable with a win in November, preferably a decisive one, than a loss. So, yep, I’m happy to vote yes. Well Zach this is going to inspire Skagitonians, Kitsap, Thurston and other neighbors to reach for the stars of transit. Especially if and when Shefali gets the football back for Sound Transit’s offense. The future is on the ballot. If ST3 passes, I think it will inspire Portland, Bakersfield, Sacramento, Spokane, Boise, you name it. Amen, and especially other booming cities that need to create transit from scratch, like Austin and Nashville. The thing that needs to inspire Portland is the downtown transit tunnel. That is the most important piece we lack. It hasn’t inspired us to do better in the past 25 years though. Too bad that wasn’t the philosophy of Portlanders when they demolished some 200 city blocks worth of housing and businesses to make way for I-5, I-405 and the starting right of way for the Mt Hood Freeway. Link is the first “light metro” in the US, meaning light rail with an unusually high amount of grade separation and other expensive subway-like features. The part that’s running now is not that much more than other light rails (the DSTT was an existing asset, and the three new underground stations compare with MAX’s and DART’s one), but when ST2 is finished it will be dramatically more metro-like (90% grade-separated), and even more with ST3 (second downtown tunnel, all extensions grade-separated). No, it won’t do anything of the sort, Joe. Nor will it “inspire” any of those other cities. Puget Sound is unique in its topographical challenges. No other urban area of similar size faces anything like the Seattle “hourglass”. Everybody needs to take a breath and hold the victory dances until the thing actually passes, no slam-dunk, to say the least. Considering the amount of work to get to yesterday and the opposition acting like the Santa Clara 49ers I think a few cheers were appropriate. “Inspire” is how you do it, Anandakos, not work location or physical even result. Moscow subways said to be gorgeous. But knowing what I’d find given Communist working conditions or benefits (though congrats for medical and pension controls!) would use a jackhammer carefully down there. What did today’s word salad mean? Are you seriously proposing that people build fancy light rail lines because they’re “inspired”? Get real; they build light rail lines so their neighbors will get out of their way on the freeway. Not so completely. There are tens or hundreds of thousands of people who want to ride it themselves, not just drive past it on the freeway. Of course. But passage requires FAR!!!! more “Yes” votes than potential riders would provide. Sure, some of those extra “Yeses” are altruistic people who believe that transit is a good thing for a community whether it benefits them directly or not. But most of the additional “Yes” votes come from people who hope others will ride, making their auto commute easier. Sorry to be so cynical, bit it’s the truth. Your neighbors in Seattle proper are not a representative sample of the people who live between Lakewood and Marysville. 1. People who will take Link regularly. Most of them are currently on a bus but some may be driving. 2. People who iwill take Link to work but not otherwise. 3. People who will take Link occasionally to ballgames, other trips downtown, or the airport. 4. People who don’t travel in Link’s area but think our overall level of transit should be higher. 5. People who will drive by choice even with Link and hope it will lessen congestion on their roads. 6. People with unrealistic ideas that Link will eliminate congestion or magically improve corridors it doesn’t run in. So there are a lot of reasons people vote yes, and I think only a small fraction are #5. #6 worries me more because it’s probably a large number of people and they willl inevitably be disappointed. There’s an actual difference between numbers 5 and 6? The difference is their personal road vs roads in general. Zach makes a great point about sufficient density throughout the lines. While I can agree the south King alignment was disappointing, that is mostly a ST2 error. I’m optimistic about solid, mid-rise urban growth developing around many of the “suburban” stations, especially in stations in Lynwood, basically everywhere in East King (rail & BRT stations), and all the communities along South Sounder. But all three of those regions will grow because they are connected to the Seattle job center, and as long as Seattle keeps booming, these lines will be successful. What I think is much more of an open questions is what will happen in the ST3 expansions into Tacoma and Everett. Ultimately, I think that will depend more on the economies of those cities than the particulars of transit investment. Will Everett continue to have a thriving aerospace industry in coming decades? 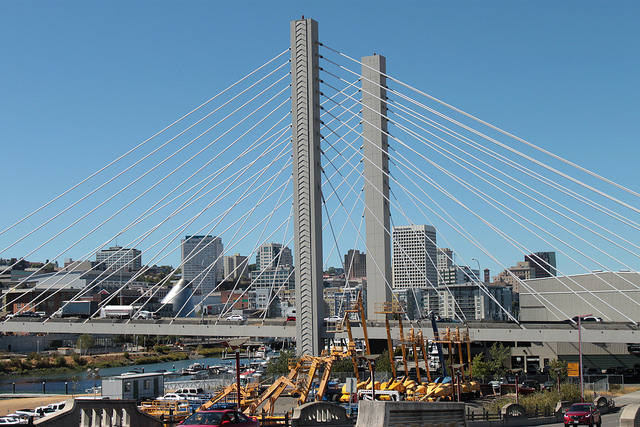 Can Tacoma leverage it’s connections with SeaTac and Seattle to be an attractive “2nd tier” city on the Pacific rim, with a legit urban core, world class port, airport, universities, etc. but a lower price point than LA/SF/Seattle/Portland? This transit investment is a bet on these cities, and will help them succeed. A better integrated Puget Sound region will help all cities succeed in the global economy, and that is what ST3 will help accomplish. One of the advantages of “going big” and picking light rail over BRT is the certainly that cities planners & developers can feel about the permanence of station locations (once selected) – I think a board-member made this point yesterday. I think that will help some of the suburbs attract development, and the long time scale of ST3 will help cities “grow into” their stations in locations where right now it doesn’t make sense. I’m optimistic about cities like Issaquah, Burien, and Fife to grow to a size that merits the transit investment of ST3 by the time those stations open. I agree. That’s why TOD is a vital piece of ST3. We’ve learnt the hard way that transit & land use policies cannot do their own thing. As we bring light rail beyond Seattle, that’s going to increasingly matter. How does making intercity transit between Tacoma and Seattle slower than today, at a high cost, help Tacoma? First – the Tacoma extension is first about connecting Tacoma to SeaTac and connecting South King to Tacoma, and only secondarily about connecting Tacoma to Seattle proper. Second, for many work trips (especially to/from airports), reliability is more important than total travel time. If I’m in Tacoma, and I have a customer meeting in Seattle or need to catch a flight, Link will be a reliable option where I can trust that I will arrive at a set time. That will make employers much more willing to locate employees in Tacoma that need to be in Seattle on a regular basis. Third, light rail to the airport should make Tacoma more competitive for landing conventions and other things that pull in out-of-town visitors. Right, because that is just what every city planner would say: The first thing you need to do as a city of 200,000 is build a light rail line to the airport, even if it costs billions of dollars. Yeah, great plan. No, the first thing you do is you invest in things like BRT on Pacific Ave, or double down on South Sounder & Tacoma street cars. ST3 does those things. But if you are fishing for a major, regional project that can impact the trajectory of the city, it’s a good project. 75 minutes from Tacoma to Seattle? I work in Federal Way with many people who live in Tacoma and points west. It’s not unusual for their Friday afternoon commutes from Federal Way to Tacoma to take an hour, sometimes more. I agree. I’m more concerned about the southern suburbs than the northern ones, because the slog through the RV means that no southern suburbs are 1/2 hour from downtown by link, whereas plenty of northern ones are. I see the northern ones growing based on that commute until they become job centers in themselves, spurring further TOD at more northerly stations. But it is a lot harder to get that process started in Federal Way, where link isn’t competitive with driving, than in lynnwood, where it very much is. I see the corridor between SeaTac and Tacoma as an opportunity corridor. There isn’t much residential NIMBY pressure. There is a freeway next to the transit line to enhance multi-modal connectivity. It will be fairly quick to get people to the airport on Link. A building taller than 10 stories will have awesome views since much of this spine is on a general hill ridge. What remains to be seen is how the developers descend on the corridor and how the affected cities react. Federal Way could look like Downtown Bellevue by 2040, for example. If ST passes in November, I expect the station areas between Federal Way and Angle Lake to see lots of development pressure because that line would open in 2024. It will also be curious to see if the state legislature will get ambitious about promoting UW-Tacoma as a second major commuter campus with lots of bachelor and master’s programs if ST3 passes. The state has an increasing shortage of tech college graduates, and we can’t just keep importing them. EHS, could you see the same thing happening if RV starts to grow & become more of a jobs center (esp. service jobs), and have the same down-line benefit of Lynwood developing a downtown? Then why was Link relegated to I-5 between 200th and 320th? Why did 216th Station fail? It may not be residential NIMBY pressure but should we call it strip-mall NIMBY pressure? And a couple blocks away are residents who don’t want 99 to grow tall. People in Des Moines and Federal Way will not be able to get to Link except by going out-of-direction east to the freeway (if there’s an east-west bus) except at KDM Road where it comes back for a station. RapidRide A is half an hour from Federal Way to the airport, which is short enough for occasional flights or daily commuting. (Given that the average commute is around 25 minutes and people start looking for alternatives when it goes above 30.) What South King County missed out on is not Link to the airport, but housing and walkable business districts along 99 with direct Link stations to Seattle, Tacoma, UW, Bellevue, etc. 10-story buildings was part of what Des Moines rejected. Kent is all for a dense urban village on the east side of 99 with direct Link stations. Des Moines wasn’t. With Link next to the freeway, theoretically you could build TOD next to and over the freeway, but that would be noisy and it’s a mile-wide no man’s land between 99 on one side and downtown Kent/Auburn on the other. Now Fife, it might have ten-story buildings. Fife has not yet clarified how urban it’s willing to get. And Tacoma has recently mused about upzoning the Dome district, but again it’s unclear how much. The corridor between SeaTac and Tacoma is also right in the middle of flight path of every plane coming in and out of the airport. Which means anybody who lives there is going to have to put up with a lot of noise. Unless pi-in-the-sky technology leads to quieter planes, the airport is going to be a permanent blight on the area, just as the airport is a permanent blight on Tukwila and South Park in the other direction. Furthermore, low-flying aircraft means severe limitations of how tall the FAA will all buildings get, even if the market is willing to build taller buildings. The Port is already planning to chop down a large number of trees that are over the height limit, which gives you and idea of just how low it is. Federal Way is just about as far from the end of a SeaTac runway as Downtown Seattle. The Courtyard already built next to the station site is 9 floors. Sure, there may be an issue with an 80-story building, but not a 20-story or 25-story one. Of course, the stations closer in like KDM may have some height limitations. So in other words, Link is so long and such relative low density in the middle because it has to go through the flight path to get to the other side. Like how there’s little between Rainier Beach and TIB because it’s an industrial area. But (A) we need the industrial area, and (B) we need high-capacity transit beyond the industrial area. AJ – Yes, I could see growth extending if the RV develops. However, the zoning in the RV is more heavily residential, so its growth (which I expect will happen) will help the housing market but won’t provide jobs for Federal Way residents to commute to on Link. North of downtown, though, you’ve already got the UW, and Northgate and Lynnwood are zoned to allow more office space than anywhere in the RV is. Adding that in to the slower and less time competitive commute for the southern suburbs, and think growth will spread much more readily to the North and East than to the south. Mt Baker is designated as a hub urban village, which means a few midrise office buildings. It’s the highest-level village in southeast Seattle. Othello, Beacon Hill, and Rainier Beach are residential urban villages, which means mostly housing and a few businesses to cater to that housing. Whereas Mt Baker is expected to have some companies that draw people from outside the neighborhood, such as an education institution or medium-sized office. However, Mt Baker’s subsequent upzone was pretty mediocre and excluded some of that potential. So its status as a hub urban village may have to be rethought. In Rainier Beach there has been some chatter of locating a community college there, but that seems like wishful thinking on the part of residents. A community college needs to be larger than Rainier Beach’s residential nature would fit, and it’s not clear that southeast Seattle needs a college or Rainier Beach is the best place for it. That’s exactly what Mt Baker’s “hub urban village” status is for: an institution the size of a small college. And Mt Baker is where all the roads intersect, and only a half-hour transit ride from Rainier Beach by the slowest mode. It’s not just the Rainier Valley detour. Southern cities are further away than northern ones. Lynnwood is as close as northern Kent, and Everett is just beyond Federal Way. The longer the distance, the greater the discrepancy between a 55 mph train and a 65 mph freeway. What cities have done that? What cities have built distant suburban rail lines first, and then have seen huge growth follow as a result? I think some of these places will grow, but a lot of them won’t, just because they aren’t that attractive to people, even with a shiny new rail line. I also agree with EHS. Not only because getting downtown is faster from the north, but because before you get downtown, you get to a major destination: the UW. Within months the zoning will change there, and you will see plenty of tall buildings to go along with the two that were built long before we put in rail anywhere in the city. This means someone from Shoreline, for example, might have a 20 minute commute (including time to and from the station) to their job at the UW, which is very attractive. Someone from Kent, meanwhile, will be no better off than they are today. Yes, up-zoning & TOD-zone (e.g. incentives for less parking) is a necessary & sufficient condition for this sort of TOD development. But I think the arrival of a light rail station will be the impetus for these zoning changing. Up-zones don’t happen in a vacuum, they need both political & private support. I don’t think Lynwood would be trying to create a downtown out of scratch is there was no Lynwood link. And yes, cities like Burien, Kirkland, & Tukwilla have ambitious TOD plans that don’t hinge on rail stations. So there is no reason we can’t get good TOD growth in neighborhoods that aren’t getting ST3 money, whether it’s Fremont in Seattle or a suburb like Renton and Kirkland’s downtowns. However, without ST3 all this TOD will be dependent on a robust bus transit system that in turn is ultimately dependent on our freeway system. Distilled to that, your argument is the effectively the same as “technical argument for BRT superiority.” As Zach argues, you may have theoretical arguments on your side, but I believe they simply don’t stand up to the political-transportation reality in Puget Sound. Yes, if I were King I would build a bunch of gold-plated BRT lines and declare bus-only lands everywhere. ST3 is rail heavy because planners, politicians, and voters don’t believe BRT is feasible in the relevant rail corridors. Puyallup is not growing their downtown without Sounder. Issaquah is upzoning around their transit center, but once ST3 passes there will be 1) Developers more willing to build to the max zoning allowed, and 2) opportunity for further upzoning because a light rail station can handle more TOD than a bus-only transit center. “Have done” is the issue. People raise the specter of Fremont, California, where BART opened in 1974 but it’s still unwalkable car-oriented. But the thing is, what cities did in the 70s, 80s, and 90s is not necessarily what they’d do today. In California in the 70s and 80s there was a strong belief that density was anti-environmental and harming the planet, gas prices were less than $2, the Bay Area population was three or four million, Vacaville was still outside the metropolis, growth-management acts were new or nonexistent, and urban villages weren’t trendy or leading much of the economy. All that has changed now. Fremont may not have been able to retrofit around Fremont Station and displace the existing uses, but it promises better density around the next station. Pugetopolis’ stations are coming in a different era so they’ll probably be somewhat better even if not wonderful. There is already a 7-floor hospital and medical center (Washington Hospital) next to Fremont BART, as well as other apartments and mid-rise office buildings..
Is “downtown Fremont” a new station or the existing Fremont Station. It is time for you to declare your vote for or against ST3. The package is not going to change in your direction, so it’s either hold your nose and vote for it or state your opposition. Nattering on about what is wrong with it is a fool’s proposition if you plan to support it. So either join the formal opposition or dummy up. Seriously, you’re giving Niles and The Crimes ammo to oppose it. He’s already declared no several times. It will be interesting to see what happens with the Silver Line stations. Tyson’s looks like it is going to take a while to transform itself. That said some of the Tyson’s stations manage to be quite busy. Closer to the airport Reston and Herndon seem like they are willing to go all in with dense TOD near the stations. But see: Beacon Hill, Seattle. Ravenna, Seattle. What was in Arlington, Bethesda, and Pentagon City before the TOD? Were they decayed industrial areas like the Spring District? I know Rosslyn is a hideous mass of hotels, highways, and concrete, so if they were like that not many people would mind redeveloping them. But if they’re leafy-green single-family neighborhoods like Beacon Hill and Roosevelt and Surrey Downs, then the no-growth pitchforks come out. Although Beacon Hill has fully ssupported upzoning according to one commentator here. It’s just a few critical landowners who are refusing to build even though they can. That and Beacon Hill isn’t ready to go as high as a hub urban village or urban center. That again comes down to the expectations neighborhoods had about light rail in the 1990s when they argued for Beacon Hill Station. *Link was originally going to go under Beacon Hill without a station.) In Vancouver the expectation would be something like Beacon Tower and Pacific Medical Center (or maybe half or a quarter of the center). But Beacon Tower is seen as an anomoly that caused zoning to be tightened, not as the expectation of future station areas or urban villages. I know Ravenna along with Rosevelt and East Green lake have seen lots of development in the past 5 years or so. Not sure how much is due to anticipation of LRT and how much is just general housing demand. Beacon hill doesn’t really seem to have taken off other than the nonprofit housing at the El Centro site. The transit related upzone was anemic and the property owner at the station site has chosen for whatever reason not to develop their property yet. East Greenlake is probably not related. It’s an extremely popular location, so building was inevitable. Roosevelt I’m not sure. It’s been held back because of the Sisley Slums. It’s probably a combination of general demand and light rail anticipation. As people have been priced out of Capitol Hill and the U-District they may be looking slightly further north and deciding Roosevelt is close enough. Plus Roosevelt has a very wide variety of local businesses if you like that sort of thing. Hey Zach, how would you categorize SLC’s transit expansions? Is it akin to Denver’s, or more like Seattle? Their light rail is a lot like Denver’s, in that all lines converge in the core at-grade, with a surplus of available land that makes construction far cheaper. Though the FrontRunner commuter rail is what Sounder should be, all-day service 6 days a week, including weekend trains from Provo to Salt Lake as late as 1am. Which on-record words of mine are an example of me saying something like “ST can’t be trusted because of rounding errors in ridership forecasts two decades ago?” Paraphrase from memory if you like. I do focus on ridership forecasts, because ridership is a key performance measurement, and because the forecasts are prime justification for Federal Govt grant support and local taxpayer support of mass transit. In any event, an interesting discussion you’ve started. The national rail advocacy community has its eyes on the ST referendum this year. The politics of millennials has not been activated for regional transit. ST should talk to national figures to see if they would endorse or promote ST3. Elizabeth Warren? Bernie Sanders? Al Gore? Frankly, there isn’t much new going on in rail outside of Denver and some long-time system gap fixes in New York, the Bay Area and Los Angeles. The next tier of metro areas have long mulled over rail systems or major rail expansion – but feel like there is no public will to implement them. Many eyes around the country are now on ST. I feel sorry for folks if they are looking at us for guidance. This is one of the worst possible examples of rail I can imagine. Does anyone think that twenty years from now, when most (if not all) of this is built, people will say “This is great, I can get anywhere I want to with transit really quickly”. I doubt very seriously this will increase overall transit ridership to equal that of cities like Boston or Vancouver BC (which have way less in the way of subway miles). If you want to look at a good modern subway system, look to D. C.. Don’t look at us. Ross, you’re becoming [ad hom]. Given the region’s population and employment growth forecasts, I’m not as skeptical as Ross is. If the system opened with today’s land uses, I would be much more skeptical. We do need better data, more integrated transit system discussions and better station area land use scenarios, though. DC Metro would be much less admirable if there weren’t so many mid-rise developments at most of their stations. Land uses really are the key here. Highway 99 through Shoteline might be an auto dominated hellhole, but there are places that are getting multi-floor condo buildings right on the border of Shoreline in north Seattle. If that had been allowed along MAX starting in 1996, the ridership would be double what it is now. Instead, they are actually moving towards downzoning areas because the school system is overcrowded. Down zones? Seriously? I guess a lot of people in PDX must be jealous of Seattle and San Fracisco housing prices. When you see people write about the lack of density along MAX and try to relate that to Seattle and what might happen along Link, try to keep our terrible zoning situation in mind. Shoreline zoned urban villages around its RapidRide stations, as did Lynnwood with its Swift stations. The argument Shoreline gave for having RapidRide stations so close to each other was that they would all serve urban villages. However, the villages have not yet materialized. Directly across the border in Seattle, you at least have a fair amount of multi unt buildings that have happened. Ross, you’re vote is for nothing, as opposed to 30-some miles of light rail in Seattle in a completed system. Let’s think for a second. Would you have supported Forward Thrust? It was mostly along freeways. That’s not great. But it gave our city (plus Bellevue + Renton) 49 miles of rail. But people, like yourself, found something wrong with it and got 40 years of nothing. If we vote yes, then we can set our sights on speeding it up, improving it, and hopefully even adding to it. If you oppose ST3, then in the reality-based world, you are effectively anti-rail. Why? Because the next vote would not happen for 4 years, and it would be for a SMALLER, STILL-regional package. And we would all be sure to come by and pay our thanks for your passionate support of improving transit in the great Puget Sound. Al, absolute worst thing about its miserable coverage of this election has been the media’s fixation on the political office with the least relevance to the work of building an actual transit system. Or, considering how both of our current President’s terms of office ended with the 2010 Congressional Elections, the running of our country. Would suggest talking to people or whatever age to want to start small machine shops and all else to create things other than speculative bets, to scope out a transit system that can deliver-maybe for the first time in decades- what they need. And also to your neighbors when you get the job of precinct committeeman. And also realize that “public will” is not a commodity- but really what people feel like doing at any given time. Most powerfully energized by what people not only desperately need to happen, but even more by what they think their own efforts can make happen. Hate categories like “Millenials”. And if people in their sixties don’t quit calling themselves “Baby Boomers”, Social Security needs to budget for a month’s diapers and a rattle on a grand scale. Politically, some evidence this is already the case. But anybody now in college or beginning the rest of their lives paying off debt for it, transit and everybody else that values its own skin had better start asking questions of and listening to. By History, major widespread crushing debt has been a nationwide puddle of spilled gasoline-waiting ’til somebody ignores a No Smoking sign. And my great-grandparents’ real American Dream didn’t have a 72″ screen, but a deep breath of relief they’d never again spend their lives crawling at the command of a creditor. That condition’s arrival on our own shores is going fill precinct, district, and county postions, both parties, coast to coast. Better gather some strong Political Will to prevent same election outcome as the 1933 one in Germany. As much as you don’t like age cohort terms, it’s clear that many people under 30 have a very different view of the world than their parents over 50. Polls on a variety of topics show this. I also think it’s silly when people start comparing former ST votes to this one. Young adults and In-migration have flooded our region with hundreds of thousands of voters that never voted in most of the past referenda. Less than half of those voting in November voted for transit in 1996. Is it too risky for cities to publicly envision higher density development near stations before November? It may inspire some voters to perceive ST3 as a better investment than forecasted – but it could turn some neighbors off. I can respect those voting “no” because of the high cost, or those voting “no” because of technical strategy objections (if there is an alternative), but I can’t respect those that vote “no” because “It won’t help me at all”. There are a lot of those people and I don’t really understand it. This is a 25 year plan. How many people will still be working or living in the same place in 10 years? Does everyone assume that are staying put the rest of their life. This attitude is almost as bad as “we already got our light rail so I don’t care”. We need to vote for the greater good of the region, not a specific neighborhood. And those that already have light rail should be looking forward to going more places. I agree. That reminds me of a discussion I had at work a few years ago. Someone was opposed to the Sound Transit proposal (the first one) and wrote, basically, “Does this help you? If not, just vote no.”. Well, that got me riled up. I wrote a very long counter argument, mentioning civic responsibility (citing examples like support for schools even though you don’t have any kids, etc.). She came back and said, “Ross, you don’t get it — if it doesn’t work for you, chances are it doesn’t work for very many people”. She had a point, and what was true then (with the first spine proposal) is true now. I’m sure there is a significant number of people who will benefit. Just not that many for the amount of money being spent. The “something for everyone” (AKA peanut butter) plan — https://seattletransitblog.com/2015/11/30/an-alternative-for-st3-with-something-for-everyone/ — would help way more people. Many of the same people (e. g. folks from Ballard) would come out way ahead. It really isn’t a case of making tiny improvements all over town (like SDOT seems to be doing) versus a massive improvement in a couple parts of town. It is a case of making massive improvements in more areas, serving more trips. For Seattle, that plan would save more people more time. Good BRT in Kirkland along with a busway from Eastgate to Bellevue would save more people more time. Similar projects to the north and south would do the same. This plan is fixated on rail and running rail to (and through downtown) instead of providing the most improvement for the least amount of money. If only this transit project spent more millions on parking, I could support it. Technology now can enable self-driving vehicles to and from rail stations Parking at rail stations will be like pay phones: still there but used less and less over time. So why spend $100 million dollars on it? Because the suburbs won’t approve ST3 in any version (BRT or LRT) without it. Yeah, I’ve always been surprised there isn’t a taxi-lobby push against Link expansion south of SeaTac. Was that an issue in Sound Move? I would have to imagine Link already cannibalizes a lot of taxi ridership to/from downtown? LV is a great example, and also rail to LaGuardia, of where rail has not been build to an airport because the taxi lobby has been able to prevent transit from taking away their business. I’m sure there are a fair number of people who use taxi-like services to connect to Link to go to the airport. From pretty much anywhere in north Seattle, a taxi ride to/from Link is cheaper than parking at the airport for a trip longer than a couple of days. (And, if airport parking means waiting for a shuttle, the taxi/transit option is probably about as fast). Granted, these trips aren’t as profitable as taking people all the way to airport, but one would expect a lot more volume to make up for it. I think Sound Move skipped Sea-Tac, Southcenter, and Northgate because they weren’t seen as important or growth areas in the late 1960s. Airline flights were expensive and highly regulated then, international trade was less, and overseas trips took longer and required more landings. 405 and Southcenter were just being built in the years leading up to Sound Move, and much of the Kent Valley was still farmland. Auburn/Tacoma was a separate job market from Seattle, and commuting from Lynnwood was probably skeletal. Except for Boeing workers who had to commute to all the plants, and were transferred between plants on short notice, never mind the 20-mile drive added. I worked for Boeing at the Kent Space Center in the early 1970’s and that was about the only buildings located in the area. When I worked the graveyard shift we would sometimes go out during the night to get some fresh air except the only thing you could smell were the animals as the space center was surrounded by farms. Southcenter had not built and the West Valley Highway was a 2 lane road. It was a rural farm area in those years and to go through that area today the change is unbelievable. The taxi lobby in Seattle hasn’t had the power it did/does in New York or Las Vegas. I don’t believe the taxi lobby really ever weighed in on Sound Move or ST2. Yesterday’s vote should have been a sad one for me personally. When started driving in 1982, the whole Downtown Seattle Transit Project was a gift from Heaven. A regional electric rail system beginning with the steering wheel of the MAN articulated bus that I had my own hands on. And its real precursor: same bus with poles on the roof. With, best of all, a long period of close-quarters operations with both bus and rail. A system that could not ever be automated. Said it before, will say it again. For all these years, world-wide this is the system I would’ve picked out of a basket of all the others in the world. Reason I’m out of patience with quarrels over “BRT”- really, if done honestly, the system I helped build for years, and drove years more. Since September 15, 1990, the Downtown Seattle Transit Tunnel as been the only Bus Rapid Transit system for many miles around. Tracks and all. A situation worth a fight to keep until first 550 passenger boards first EastLINK train. Meaning the (talk about useless waste of a billion dollars’ tax money!) Convention Center expansion can wait. Or built around our operations out of CPS. Because in addition being to the ongoing support system any spine including the human one needs to survive, ST-3 can easily lose the election if voters sense that for most of if not the whole rest of their lives, they’ll be watching grade being separated while trapped in stuck cars. Or waiting outside in the rain. But my main thought before turning off the radio this morning is that for either regional transit or our region to survive, this project needs to start with one major combined effort and goal: kill the idea that our homes, work, and lives are forever beyond our control. Screw the stock market. The housing market, with a powered Phillips head. Employment (or its opposite) figures with a jack-hammer. (Good rhetoric though nauseating images). And every other headline and news lead telling us that if we’re not rich, we’re deservedly permanent refugees. With nothing we can do about it. With our every choice as we build this project, which presently barely exists on paper, I think its within our power to design and build this system as many human hands and brains on its controls as possible. Delivering the quality we’re always mad that machines themselves don’t have. For my own ST-3 “kick-off, would like to start showing BRT supporters our 25 year old real one- rails and all. Does STB have any ideas for my first step? Reason I see every screw-up, blockage, and slow-down in the DSTT as at least railcar-or-bus load of lost votes. Could I suggest an interpretation paragraph in some of your posts, explaining in simple language the point for those who don’t understand it. Unlike Sam, I don’t have five PhD’s and I’m not the world’s foremost Humanities/History/Sociology/Physics professor and I didn’t fly missions against the Red Baron in World War I, so I sometimes have trouble understanding what attitude you’re trying to promote. Thanks for the observation, Mike. Seriously. Often write in a hurry when half-asleep. And early in a spoiled life got used to an editor. Attitude I’m after is that yesterday’s ST Board meeting concluded with our chance at the same order of that preceded, and also was, World War II. And I-405. Leading directly to Bellevue. And Kirkland which a strong campaign needs to remind them. Which also saw to it that for 70 years, ordinary people were able to live where their own hard work gave them the right to stay for the rest of their lives. Not the two weeks until their next rent increase. But my main point is the understanding that Government is neither a tyrant nor a benefactor. Nor its works either thefts or presents. It’s ours, The People’s, own tool. With with we assure, with our own hands and brains, that no man-made commercial arrangement can call itself an Act of God and live. “Stimulus” is what lets a dry-cell battery make a dead frog twitch. And I-90 wasn’t in the welfare budget. Or pay scale. And its kind likely paid for the education of many grey-haired T-shirted attendees yesterday. I’ll capitalize the “D” when the party calls itself Liberal and its chosen constituents Working Class. And will support, discuss, and do my best to shape ST-3 as the Public Works Project that sets the example for the rest to follow. Anybody with a problem over that, win or lose, “If the Earthquake don’t get you then the Markets will!” Sorry, Tennessee Ernie Ford. 1) Cost Effectiveness – it would be more cost effective to invest in BRT and park and ride lots. Both cheaper and faster in terms of commute timing and build out. 2) Lack of vision – ST3 assumes we will be moving people the same way forever. That doesn’t make sense or track (pun intended) with the direction of transportation technology. Small form factor vehicles (think Elio) and self driving vehicles will be a reality in 10 years. We need to invest in preparing for them. 1) That depends on how many people you are trying to carry. BRT and P&R lots may be more cost-effective when ridership is low, but if the goal is to build a system to carry over 100,000 people per day, rail scales a lot better. $80,000/P&R space adds up fast. 2) Autonomous cars will complement, not replace mass transit. There simply isn’t enough road space to put each person in a separate car, autonomous or not. Which means that even with robocars in widespread use, people will still ride transit if it bypasses traffic jams and gets them where they need to go faster. What autonomous vehicles does mean for transit, however, is that we should be very weary in investing large sums of money in P&R lots because one thing robocars can do very well is move people short distances between their suburban homes and the nearest rapid transit stop. That said, I am also resigned to the fact that a large proportion of the public is unaware at just how much parking costs and how few riders it really brings to the system, so if throwing away a few tens of millions of dollars in a $50 billion package is the price to pay to get the votes to allow the package to pass in the first place, I would still say it’s worth it. Parking is expensive, no doubt, but so is 54 BILLION for less than 60 miles of rail. I don’t claim to be an expert, but I don’t believe that the cost to building more asphalt reach that same cost per mile. I also don’t completely agree that the ridership capacity argument is accurate. depending upon how the BRT system is developed. As far as autonomous cars go, that goes back to the question of road capacity. We are making a lot of assumptions regarding them that we frankly don’t know yet. We also don’t know if we can have automated BRT. That would reduce costs significantly. The reason the cost per mile is so expensive is that building any kind of transportation infrastructure, grade-separated, in the middle of a city, is expensive. For instance, to cross downtown, you cannot just lay asphalt, you have to tunnel. And if you want to compare the costs of a transit tunnel to a highway tunnel, we need look no further than Bertha and it’s $4 billion (and counting) to tunnel 1.7 miles. Branden – someone else would have to give you figures, but I would imagine creating 60 miles of new highways (not simply adding lanes to existing freeways) along the corridors proposed would probably cost nearly $50B, and have much lower capacity. Compare the downtown tunnel (not the stations) to the 99 tunnel, and I think they are quite comparable at $2~3B each [someone correct me if I’m wrong with that number]. Laying asphalt is cheap. Buying right of way, building bridges, and digging tunnels is expensive, no matter the mode. It’s also $54billion in year of expenditure. Exactly. people who say BRT could completely replace Link at less cost somehow assume you could run hundreds of more buses on existing roads. That’s the usual fallacy of “There’s always enough road space and parking space for one more car.” The cost of building new transit-exclusive road lanes, viaducts, or tunnels, is not zero. It’s in the billions of dollars, or the same as Link. If you’re going to build new right of way, you might as well put trains on it since they have more capacity for possible future needs. 1) Rail scales better when the vehicles are full or close to full. This is because the cost is largely dependent on the driver per rider ratio, and a full train carries a lot more people than a full bus. But Branden’s point is that pretty soon that ratio will become largely meaningless, as there will be no driver. Then other factors come into place. What is the trade-off between running a cheaper vehicle (e. g. bus) versus running more of them? Is that savings worth the reduction in frequency (it may be cheaper to run a train every ten minutes versus a bus every two minutes, but just about everyone would prefer the bus). Which gets to the key operational point, which is whether these lines can support the ridership for a line that is both cost effective to operate, but frequent enough to add substantial value. I have my doubts. The only line that comes close to that is Ballard to downtown. Of course while operational efficiency is great, for the kind of money we are talking about here, capital costs are way more important. With or without automated transit vehicles, whatever savings we get from one mode or the other pale in comparison to how much we are thinking about spending on this. I agree with your other point about automated cars. If we really think that automated cars are right around the corner, then we shouldn’t spend a huge amount of money on park and ride lots. I agree about the P&R lots, but I see those as near term solutions not really a long term approach. They could also be converted to “automated car barns” or bus transfer stations, but that is an unknown. My main point is that we need to consider this a two prong problem. First is reducing congestion in the near term. Second is creating a system that will be able to adapt to the changes in transpiration technology. If the technology gets to the point where people accept self-driving cars, then there will come a point where they will also accept self-driving light rail trains. If anything, self-driving cars will increase congestion because the number of cars going from one location to the next without a driver. They will also not be able to drive dangerously close to nearby other cars, like human drivers do. So, the technology might change but the basic physics doesn’t. The technology is not there yet for ST to commit a $54-billion plan on. The only proven driverless technologies at this point are existing ones like Skytrain. In the window before construction there will be time for ST to incorporate incremental technological improvements as they become well-tested. That probably won’t include full driverless because of the surface segments, but it could include things like lighter vehicles, more convenient floor pans, better turning ratio, or better motor drive. Driverless trains already exist in Dubai. 1) Rail scales better when the vehicles are full or close to full. It’s cheaper to operate a single long train than several short trains. Sometimes that means being willing to have empty seats. MAX runs two car trains almost all the time now rather than try to switch to single car trains during part of the day. Sometimes there’s lots of empty seats. Given that, you would expect the cost per passenger mile to be more on MAX than Link, which even before ULink had lots of passengers going all the way to the airport rather than the MAX situation of passenger concentration towards the center of the system. Pre ULink, Link costs about 2.5 times per passenger mile than MAX does. Per passenger costs on MAX are about the same as the frequent bus network, yet passengers travel only about 1/8 the distance on average as the.frequent bus network, which is all too often overcrowded. Airlines operate on the idea of filling every seat, and for point to point traffic that works. Also, airlines cost a lot to move empty seats. However, let’s suppose you have Amtrak Cascades. There’s lots of traffic between Seattle and Portland, but historically Tacoma and Vancouver WA were fairly busy too. If it is sold out from Portland to Seattle then neither of those stations can have boarding passengers. So, to serve those intermediate stations you need to tolerate some empty seats. BUT EMPTY SEATS COST MONEY!!! Not necessarily. If I owned an Amtrak compatible car, I could have Amtrak couple it to the back of the Coast Starlight and move it for (I think the current charge for private car towage is) $2.50 per mile. They charge somewhere around $150 for the labor associated with actually doing the coupling. These are obviously not light rail numbers. It isn’t even Amtrak’s own labor numbers but charges for outside car owners. It gives you some idea why sometimes it may be cheaper to run with a bunch of empty seats rather than turn potential ticket sales away, though. Unlike airlines or even buses, additional empty seats are not that expensive on a train. You don’t want them to be empty, but it isn’t necessarily a catastrophe that they are there. It may be vastly cheaper to put up with some passengers and some empty seats on a train than trying to move those same passengers on two full buses. As I said above, it depends on the circumstances. There are driverless trains in many cities across the globe. 3) Hiring twice as many drivers (to avoid a really long gap in service, the buses would have to enter service in the late morning while the trains are still on their way back to the base). Because of all this, it is usually cheaper to simply run the trains all day, or at least enough of them to reach a level of midday service frequency that is considered acceptable. The extra flexibility to meet occasional spikes in ridership for special events is also a very good thing to have. The main problem for any system planned around separate vehicles of any size is the space between them needed for safety. Which increases exponentially with their speed. Next DSTT trip, watch LINK come into any station, and add two imaginary cars. Standing still, 360 linear feet. At 60 mph, same length, all except for drivers’ cabs and couplers- and every foot carrying passengers. My estimate, platoon of 60′ buses same length as train standing still. Though carrying fewer passengers, with standing ones much less comfortable than on train. Current drivers, check my memory. I think Metro set artic following disance- back bumper of leader to front bumper of follower at one bus length for every ten miles an hour. By my math, meaning five spaces per platoon could carry a loaded four-car train full of passengers each. In addition to the 360′ combined length of the buses. So this is my approach. Substructure, grade, and curve any busway for rail. And either install rail for future use, or cut grooves into the pavement filled with cement that can be jack-hammered out to install the rail. And don’t ever try to get away with anything like highway paving, let alone arterial. Those artics are heavy. And those monsters tear up pavement. And cheap out on this, and all rail advocates will need to do is put compared seismographic graphs on YouTube. Even worse: samples of handwriting done on each one. Incidentally, standard recommend now: Thinking about BRT, spend some pm rush hours in the DSTT. Special attention to Westlake and IDS, watching order and spacing with which buses enter the Tunnel. Excellent study in things not to do, and also to fix if somebody did them. On premise that the Convention Center will be discovered to have been cleaned out by its current secret owner’s Presidential campaign and expansion will be placed on hold. 1. BRT in the US gets watered down. Getting space from SOV’s for busses is always an uphill battle. Witness Rapid Ride or the SDOT “BRT” projects that don’t speed transit through the worst bottlenecks. 2. Cars will still take up road space and parking spaces. The amount of road space used is likely to be the same for a number of reasons including bicycles and older vehicles. Busses are likely to still be staffed for a number of reasons including security and helping disabled passengers. People have been proposing magic solutions that supposedly will make all other transit obsolete for a long time now. Still busses and trains remain the a bone of the world’s transit systems. 1 and 2 are quite true. Although with ST proposing using the ETLs, I do not think the ETLs provide the necessary reliability once you get to the SR 522 segment. If the Eastside politicians get their way and even the Ds are ready to throw this pilot out the door, 405 BRT isn’t going to pencil out. Got to do it like they do in Brisbane. Teensy-weensy little correction here–the express buses aren’t theoretical. Whether or not those express buses will be completely stuck in traffic is theoretical. ST won’t be running them, so they’ll be gone. All of ST’s 2023 planning scenarios in 2014 had ST Express truncated at Des Moines, Lynnwood, Bellevue, or Mercer Island; and that was before ST3 was solidified. Metro may continue an all-day express to Federal Way. But who will run express buses from Tacoma and Everett to Seattle if ST doesn’t? Who will pay taxes for them? ST won’t be running them, so they’ll be gone. Or Sound Transit deciding that rail is a better use for people’s tax dollars. You did a wonderful job of explaining why the suburban lines will fail, but then completely ignored similar weaknesses within the urban part of our system. Consider the West Seattle line. For a couple billion, it adds three stops. How many people will take a bus from one stop to another? A few dozen, at best. Compare that with U-Link, where we added two stops. That one combination (UW to Capitol Hill) carries more people than the other two in West Seattle combined. Same with Northgate Link. Even the shortest trip (U-District to Husky Stadium) will carry more than any combination in West Seattle. It didn’t help that you ignored the role that complementary bus service can play in the success of a subway system. Not feeder buses — which have their place — but intersecting bus service that adds real value, even when it doesn’t involve the trains. It is obvious that West Seattle has very little of that — most of the buses go where the train is headed. But the Ballard line — the best proposal by far — suffers from the same problem. The line wraps around Queen Anne and serves Ballard. The neighborhood of Fremont lies adjacent to both Ballard and Queen Anne. Yet this does nothing for Fremont, except perhaps lead to a somewhat better connection to Interbay. Getting to north or upper Queen Anne will involve an extended 13, while getting to lower Queen Anne will involve a bus headed south (e. g. 40) along with a refurbished 8. (Once Bertha is done digging, the 8 will avoid the Denny mess by going on a brand new bus lane a couple blocks north — http://www.seattle.gov/transportation/docs/mercer/2013_0211_PhasesMap_v10b.jpg). Compare all that — compare every single urban and suburban proposal — with just one idea, the Ballard to UW line: http://stb-wp.s3.amazonaws.com/wp-content/uploads/2014/06/Ballard-Spur.png. Now look at the existing transit map: http://seattletransitmap.com/app/. You can bet the Metro planners would be drooling over that line. They would be greeted as heroes, no matter what they do. Cut the 44, slide the 26 over a few blocks, and add service anywhere. Hurray! We finally have a fully functional grid for most of the city! Now compare that to what Metro will do if ST3 passes and you can hear the whining already. Truncate the 120 at noon, forcing riders to make a transfer, thereby costing them an extra ten minutes? Move the 40 onto 15th and Market, thereby slowing it considerably and cutting it off from the heart of Ballard? It will be Capitol Hill restructure all over again. No easy answer, just a choice between either ignoring the billion dollar investment you just made, or screwing over a substantial portion of your riders. >> We already carry 80% more riders per mile than Portland, for instance, and that disparity will only grow with ST3s buildout. What an absurd assumption. You even explained why in one of your paragraphs. We will be adding miles and miles of track, with only a minimal increase in ridership. This will simply dilute the system. When Link gets to Lynnwood, people from north of there will take express buses to Lynnwood. If Link is extended farther, then there will be a very minor increase in overall ridership, but a huge increase in mileage. Do you really think that trips from Ash Way to 128th (now more convenient than ever) will make up for the increase in mileage? Our system just added a couple stations, and only a few miles of track, yet it increased ridership substantially. That is what happens when you build rail with “sufficient density to maximize turnover at all points in the system”. Are you saying that trips from Fife to Milton will soon compete with trips from Capitol Hill to the UW? One of the common arguments for building this enormous system is that traffic is terrible at rush hour. Commuting by bus — even on the freeway — is slow. But no one is making the case that this will completely transform a trip in the middle of the day. Even with the Seattle projects, that simply isn’t the case. This is a subway built with commuter trip patterns in mind. Which is why this is a horrible waste of money. We are paying subway prices for service best served by commuter rail and express buses. It is a really depressing experiment, when all similar experiments have failed miserably. You seem to be confusing quality with usefulness. Even if you don’t think it’s useful, the line to Everett is 100% grade separated and will run at the maximum speed the feds allow. That’s quality. Yes I’m agnostic on the usefulness, but stating the quality as fact, as Donde says. Like, Donde said. BTW, I asked in yesterday’s Seattle Subway piece who was their source that provisional (arguably more useful such as Ballard to UW) lines would be funded in ST3. Can anyone confirm? Bueller? But it doesn’t have a transmission. It can’t go anywhere. Don’t confuse usefulness with quality kid — do you want this quality beauty or not? I’m still not super-sold on the “need” for light rail all the way out to Everett. But, as long as it’s Snohomish’s money that’s paying for it, and operational costs don’t lead to a reduction in frequency on the Seattle segment, I don’t care. While I would much rather see Ballard->UW, Ballard->downtown will still be a very useful line, in and of itself, and I would much rather see that than to insist on the most efficient line that people are not willing to build and end up with nothing. I kinda think the Ballard-downtown line will be the defacto Ballard-UW line. People will ride link to westlake and switch, cause even tho it’s farther, it’s way faster. Fair enough. I think most supporters of this plan feel the same way. The Ballard to downtown line is the one piece of this that is a reasonable value. But that is setting the bar way too low for me. I find it hard to accept spending this kind of money on something that — overall — is not a very good value. I’m OK with imperfect (I never expect perfection) but it is nothing like what successful cities have built, and every bit as flawed as the failed systems. Those other systems failed not because they cut corners, and have limited headways, or congestion downtown, they failed because they didn’t try to mimic real, old fashioned subways. Draw the smallest circle you can around the New York City subway and it has a diameter less than 25 miles. Draw a similar circle around ours and it is over 50. That is New York City we are talking about. Go out 30 miles and you have cities and towns way more densely populated than ours. Hell, some of those areas are more densely populated than anywhere in Seattle! 1) A system that is dense, with multiple intersecting lines spreading out over miles and miles, covering every major area of the region. DC is a great example, as are older systems (New York, Boston, Chicago). 2) A dense but very small system that depends largely on complementary bus service. Toronto and Vancouver come to mind. The first is very expensive, while the second isn’t. We are building neither. If you view the system as a whole, we are spending way too much on a very spread out system. If you look at Seattle — just Seattle — we are ignoring bus service, yet not providing the all encompassing set of rail to replace it. This is a huge amount of money — just in Seattle — while it does nothing for the bulk of trips here. Even common, everyday trips that involve areas with stations (Northgate to Ballard) don’t benefit. Wait for ST4, or ST5 I suppose. Except there won’t be an ST4. Even the biggest proponents of this ridiculous project — Seattle Subway — said as much. Once the spine is complete, the job is done. There will be no stomach for big projects in the suburbs, and thus that will blow a big hole in any subarea equity dominated set of plans. Which means that Seattle will have to go it alone. I figure we might as well start now. I don’t want to spend a bunch on this mess, then watch as folks reject something that makes much more sense because they are tired of spending money on transit. Maybe they want to spend money on other, some would argue, more important things (health and human services, police, education, day care, etc.). @Donde — I kinda think the Ballard-downtown line will be the defacto Ballard-UW line. People will ride link to westlake and switch, cause even tho it’s farther, it’s way faster. No, it’s not! That is the whole point! Going from Ballard to the UW to downtown is only marginally slower than going directly to downtown (https://seattletransitblog.com/2015/08/14/fast-train-to-ballard/). But going the other way is way slower. Roughly 24 minutes, which is competitive with the (really slow) bus right now. 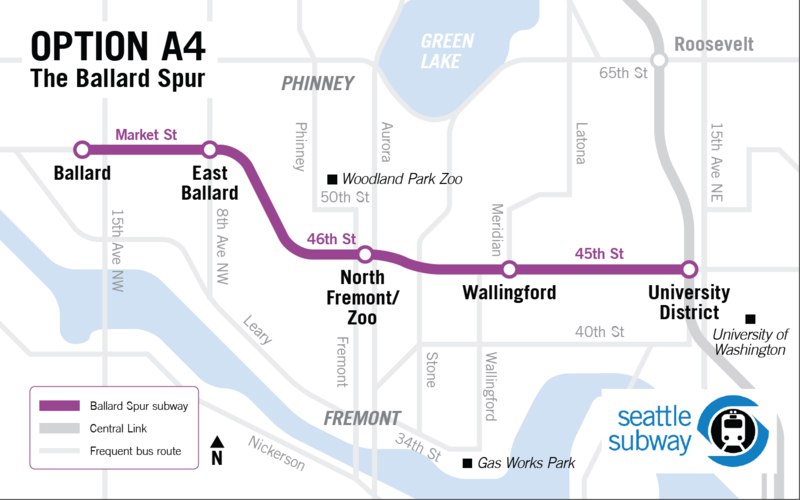 You still have to make a transfer, and it is much tougher to time that transfer than it is a Ballard spur (https://seattletransitblog.com/2015/03/23/ballard-uw-downtown-link/). So even when the other train is running at its most frequent (six minutes) that is enough to make the bus faster, even during rush hour. Meanwhile, who knows what SDOT will do. If they phone it in, like they did with Roosevelt, then it won’t help much. But if they like they did with Madison (add substantial amount of improvements) then a bus will be much faster. A train could make that direct trip in less than ten minutes, with all of the stops. A bus should be able to do 15, or at the very worse 20, making it faster than the train combination, even if there was no transfer. It also misses the point. These lines shouldn’t be judged just by their end points, but by the various combinations they enable. If traffic gets even worse along 45th, and the city does nothing, then “going around” might make sense for Ballard to the UW, but it won’t do anything for the areas in between. Also , a Ballard to UW line would likely be built much quicker than Ballard to downtown (remember, new downtown tunnel plus a bridge or tunnel). Yet people are taking buses a mile or two to UW Station, in higher numbers than predicted. Why should West Seattlites not do the same? Of course the population in West Seattle is lower, but at the same time it’s an entire quarter of the city. And one which has only three roads out of it, which creates havoc whenever one of them melts down. Depending on one’s ultimate destination, it may not even be an extra transfer. For instance, a trip from Lincoln Park to the U-district is a two-seat ride with ST2, and would remain a two-seat ride with ST3. The only difference is you’d be switching over at the junction, rather than downtown. I gag at routing West Seattle Link to Fauntleroy. Better to go straght down from the Junction to Westwood Village. But if Link does make the low-volume detour, Lincoln Park will be just one bus stop away from the station. Yet people are taking buses a mile or two to UW Station, in higher numbers than predicted. I don’t know who predicted low numbers for UW to Capitol Hill. I sure didn’t. But anyway. Why should West Seattlites not do the same? Of course the population in West Seattle is lower, but at the same time it’s an entire quarter of the city. And one which has only three roads out of it, which creates havoc whenever one of them melts down. What? One quarter of Seattle’s population lives close to those three stations? That is news to me. Sorry for the snark, Mike, but I really have no idea what you mean by saying it is “an entire quarter of the city”. That makes no sense at all to me. 1) Lots of people make that exact trip, with no further transit connections. They walk from the hospital onto a train, then from there to their house. Or they walk from some UW building to Seattle Central. They make dozens of similar trips. 2) Since the terminus is at the UW, and lots of buses are routed there, it is serves as a connection for the north end to the Capitol Hill area. Ravenna to Capitol Hill, for example. 3) Even with the nature of our deep bore tunnel, it saves time over surface options, like the 43 (which has also been decimated, making it no longer a frequent option). 4) It is very frequent, because even if no one took that trip, there are enough people headed to the UW to justify frequent trains. Now compare that to the West Seattle set of stations. 1) Only one stop is anywhere near a populated area (the station serving the junction). The other two are next to golf courses or freeways (or both). Density by the junction is decent (although not as high as, say, parts of Magnolia). Density surrounding other stations is well below average (probably because of the freeway and the golf course). 2) There is nothing else by any of the stations. No major employer or college. As someone who has driven to West Seattle plenty of times, I can tell you there is pretty much no reverse commute. It gets a bit congested by the college, but this doesn’t serve it. 3) Buses can (and do) go between the stations, and do so in a reasonable amount of time. The time savings between the stations is nothing like that found with UW to Capitol Hill (a ride that can be congested in the middle of day, or delayed significantly because of a bridge opening). It is simply a different ridership pattern, much more one that resembles a suburban area than an urban one. It is a commuter pattern, with the bulk of people heading to the same place — a trunk and branch demand pattern..It is largely dependent on feeder buses, with very few people gaining from the new connectivity within West Seattle (three stops means three combinations but my guess is that all three combined will be a few dozen) . That is why the BRT plan made more sense. The people that want to transfer would do so at SoDo or (more likely) transfer well away from these three stops. No big loss. This makes it completely different than everything built in Seattle or planned for Seattle. I find it appalling that such a plan is proposed while a bus tunnel wasn’t seriously considered, considering the obvious advantages of the latter. @asdf2 — Good point. But a bus tunnel would enable similar connections. Every ride from West Seattle would include a one seat ride to Belltown. Depending on which bus you got paired with, you could have one seat rides to Denny and Aurora, or lower Queen Anne (either one of which would be connected to a new and more frequent 8). Then you either continue to somewhere in Ballard or somewhere on the Aurora corridor. No matter what, you would have two seat rides to all of that, as well as all of Link. So a trip from High Point (the most densely populated census block in West Seattle) to 65th and 24th (in Ballard) would be at most a two seat ride, instead of the four seat ride that would be involved with ST3. All of Link, of course, would also be a two seat ride (e. g. West Seattle to Bellevue or Beacon Hill would be a two seat ride, not a three seat one). Then there is a frequency. Generally speaking, agencies don’t like to run their vehicles very often if they are less than half full. It is cheaper to run a bus than it is a train. Therefore, it makes sense that along the same corridor, a bus would run more frequently. From downtown to the UW the train will run very frequently (it is by far the most efficient part of our system). But I don’t think the trains will run as often to West Seattle, which means that not all two seat rides are the same, and chances are, the transfer in West Seattle will be worse than one made downtown. One quarter of Seattle’s geographic area. That’s the area people have to walk across, bus across, or drive across to go from one place to another; in this case into or out of West Seattle. If you’re in Columbia City you can easily walk to or bike to Mt Baker or Jackson Street if you wish to. If you’re in West Seattle you can’t walk or bike to Jackson Street so easily both because of the distance and the river barrier. But a well-functioning city does not block off a quarter of it from the rest of the economy or housing choices. Keep in mind for many in NE Seattle that we have no other choice but to ride the bus to the UW Station. Oh boy, that is so absurd, I don’t know where to start. First of all, they aren’t “blocked off” from anything. They have a freeway which connects them to the rest of the city, as well as several bridges. This light rail line, serving only a small portion of the huge area that is West Seattle, will not “unblock them” either. It will simply provide a different way to get to other places. A very expensive, often inconvenient way. You mention a fundamental weakness within the light rail proposal and then say that it is a strength. Proximity and density matter. West Seattle has neither. The lack of proximity will not encourage them to take more trips on transit, nor will it make running or building a rail line more efficient. It will do the opposite as it has all over the world. Ever wonder why Vancouver doesn’t run a rail line out to North Vancouver, despite being quite similar to West Seattle (except way more densely populated) with the same sort of limited access to the rest of the city? Because it isn’t worth it. You don’t get the kind of trips that generate the kind of ridership that make spending billions on rail worth it. Using your logic, we should start planning a light rail line out to Vashon Island. It is a very large area, and we should unblock them. If the freeway didn’t get bogged down with traffic regularly and have several-hour gridlock a few times a year, they they probably wouldn’t be so insistent on light rail. You don’t understand that distance causes a greater need for motorized travel. Vashon is rural, tiny population, whose downtown is three blocks of one-story businesses, further away, not in Seattle, and turned down a bridge the state offered them in the 60s. That’s my point. RossB says West Seattlites will be turned off from transit if they have to take a bus to a Link station. But they’re doing it at UW Station. I just noticed this. The “feeders” will double as frequent buses across West Seattle, which doesn’t exist now. So Link allows the bus hours to be redeployed for full-time frequency and intra-penninsula trips. Those who don’t leave the penninsula can pretend Link doesn’t exist and they’ll still have better service. And those who want a one-seat bus ride to downtown and live near Delridge will still have it, every fifteen minutes full time. Wow, what brilliant detective work! I had heard rumors that there are to be two lines running between Lynnwood and Downtown Seattle, alternating service to Bellevue and West Seattle, but this is the first time I’ve seen it verified in print. Where did you find out this important but heretofore well-concealed fact? Perhaps we need to inform President-In-Waiting Trump about this egregious omission of crucial information before the Referendum. We don’t want to stumble into a STexit by mistake! Two lines to Lynnwood has been the plan ever since East Link was created and put into ST2. It also addresses the all-day capacity needs between downtown and the U-District, downtown to Northgate and, as ST sees it downtown to Lynnwood. (East Link was originally going to go to Lynnwood peak-only, but ST later extended it to full time believing Lynnwood would need the capacity.) West Seattle will be less frequent, but not less frequent than Rainier Valley is now. ST hasn’t said that two lines will go all the way to Everett full time, as far as I know. That’s because these systems already have more lines and cover most of their cities, so there’s not as much need to expand them. Everett is surprisingly undense even in its historic urban area. I wrote earlier about how the oldest residential area, even though it has an admirable street grid, has such wide Magnolia-like setbacks that you could fit an entire second house in every front yard. I would have expected that in 1950s zoning but these houses go back to 1900. And like front yards everywhere, they’re little used, and some are just plain narrow strips of lawn. Lynnwood is positioning itself well for a Bellevue boom if the companies come. Right now they and their workers prefer to locate in Seattle-Bellevue-Redmond. But that could change as the population increases and the number of large building sites in downtown Bellevue and SLU diminish. Companies don’t look just at location but also at minimum size and nearby housing affordability, and both of those will trend in Lynnwood’s favor, especially since Link is half an hour to downtown and an hour to the airport, every five minutes. Federal Way won’t have as much advantage since it’s further out and that Link segment is slower. Tacoma is better positioned for an urban renaissance than Everett, but it will have to be as a mostly independent job center, not as a bedroom community for Seattle and Bellevue. Somebody is riding Sounder and the 59x northbound in the morning. Tacoma has tried and failed to get and retain employers, so the only way to get much more than a minimum-wage job is to commute to Seattle. Tacoma’s non-bedroom future depends on turning that around. hence payment should have been based more on a sales tax increase like LA and Phoenix’s initiatives. 2) Areas left off LR but stuck with BRT or nothing will never see LR in this century, just ask Boulder and Longmont Co how they got the shaft in RTDs initiative. Sales tax is the most regressive on the poor. If you have property, you already have an asset to live in or sell. The poor pay sales tax on toilet paper and shoes. Los Angeles is in California, which has an income tax and thus a different balance of what they’re getting for their income/property/sales taxes. (It also has Prop 13, so that chops its ability to get much from property taxes.) ST3’s total taxes are a combination of sales, property, and MVET, so it’s not like it’s not using sales tax. The tax combination and rate limit was explicitly set by the legislature, so it’s not like ST has a choice. The only thing ST could do is cut off a third (or whatever the percentage is) of annual spending to avoid the property tax, which would then make projects take a third longer or require canceling a third of the projects. The public wants a lot of high-capacity transit now, not a third less or a third longer. And the public is more opposed to MVET than it is to the other taxes, so that’s the one ST tried to avoid using. The second article says the primary problems in Atlanta and Miami were recessions: the tax didn’t bring in the expected amount of revenue so of course they couldn’t build all the projects. That’s the same thing that happened on south King County in 2008, when ST2 Link was truncated from 272nd to 200th (and later resurrected to 240th). That’s not the transit agency’s fault, it’s what happens in an unpredictable economy. I’ve also heard that Miami made a mistake in land-use predictions, sending the train in the direction they expected middle/working-class growth to occur but it ended up occurring in another direction instead. Oops, the article I meant was Zach’s Miami article, not les’s Phoenix article. You guys want to see this pass? Do you really want to see this pass? Get out of your comfort zone. Walk your neighborhood and talk to your neighbors about this. Talk to your co-workers. Never mind those who dismiss or disagree with you. When you run into somebody who MIGHT vote for this, give them the compelling evidence of why they should absolutely vote for it and make sure their ballot gets turned in on-time. This needs to be a grassroots effort. This needs to pass, not by a 1% margin, not by a 5% margin, but by a landslide. We need to turnout the vote and show our region’s leaders that we are serious about this. If they see that their constituents want mass transit, we’ll start seeing the change that we want in our communities. That’s what has started getting me even more worried about housing prices. I read that with the current median rent and growth rate, we’re set to reach $4000 in just eight years. The city really needs to start building tens of thousands of workforce units now, on top of what it’s already doing with HALA. Even building enough market rate units will slow the rise in rents. Don’t know about this being unprecedented. Dollar value in DC, Atlanta, Denver and LA were lower, but they came earlier so absolute value may be similar. Denver and LA are certainly getting the large number of miles of track. To RossB: Thanks for all your efforts to promote BRT over higher priced LRT over the years. It appears the voters will now have the final say in the open arena of decision making. For the record, Washington now sits near the bottom of the list on road and bridge maintenance backlogs (41st in the nation) and while voters within the ST voting area will drive in excess of 30 bil passenger miles this year. ST will log about 450m annual passenger miles and MT about 650m, so their combined effort to move people is about 4% of the total. Last year buses cost ST $0.42 a passenger mile, while LRT cost nearly double that ($0.72), and that doesn’t count interest or depreciation of about $20 a boarding for LRT. Your concerns about sending rail to the ends of the earth, while ignoring practical transport solutions is still valid – just ignored by most. I agree that there are less costly transit options, but they are 1) harder to sell 2) likely to be easily undone 3) not as impressive or comfortable as light rail 4) less likely to drive land use change. Precisely Romp, which is why I revolt at building something that takes another 30 years to finish, and barely makes a dent in the mode mix when finished. Status quo is not an acceptable option for me, no matter how nice the ride is. Variable tolling of the limited access highways could and should be implemented. The spine could be bus. The capacity of Link is great, but is very costly, takes a long time to build, and the ST Board is placing it in the freeway envelopes, limiting its TOD potential. Agreed. ST3 throws about $32 bn at LRT while only spending $4 bn on both Commuter rail and BRT combined. Clearly, ST is about building shiny light rail and not so much about moving many more people than is the current case. Who should implement variable tolling? WSDOT? ST has no authority to do it on its own. WSDOT is mostly interested in car volume, second in toll money, and bus speed gets relegated to “Maybe if there’s capacity left over”, similar to Roosevelt BRT. Also, variable tolling is one Eyman initiative away from being banned. But if you like variable tolling, you should love 405 BRT. That’s an ST3 project too. And there’s 522 BRT. Mike Orr: who? Washington State. SR-522 is an arterial state route. Of course it has! Washington Metro was a 98-mile fully grade separated plan, approved all at once in 1968. Nothing like this has been proposed since roughly 1980, though. I think Honolulu’s upcoming light rail system, HART, could rival ours in terms of design and system performance. HART is entirely elevated with no street crossings- however, no water crossings or tunnels. It’s a hell of a thing. Is that technically true? Unless it’s been changed I was under the belief that the East Link extension to DT Redmond would have at grade crossings in the section using the old RR ROW? I know this extension was originally part of ST2 “if funding permits” but it seems to be playing both sides of the tracks to say ST3 funding is necessary to build this (I believe it will happen regardless) and simultaneously claim ST3 is 100% grade separated. It also ignores the fact ST3 funding is earmarked for infill stations along MLK which is not grade separated. I feel like the Seattle tendency is to just be unreasonably cranky about imperfections in even a very good plan. People fixate on small problems and blow them way out of proportion. This is a really good plan. It doesn’t go everywhere I want it to go, but it is a giant leap in the right direction. I’d like to hear more about the shoulder running bus idea. How serious are they about that, and what is the timeframe? It’s on the st3 map. It seems like kind of a risky idea, but one that could seriously improve existing ST3 bus service. speeds. I am having trouble seeing this as a good value. I would rather spend the money on useful routes in seattle and leave the long spine extensions out, let them ride buses to northgate or seatac and build a network that actually lets you get around the denser areas of seattle in a reliable fashion. I don’t care how big it is, how ambitious it is, or how many miles of track it offers. I don’t care what our peers are doing and I don’t care that it’s a grand experiment. This is what I want to know: how are we going to make public transit the default, and to what degree will this proposal help make that happen? This is my goal: most of the people, most of the time, should be able to make most of their trips via efficient, economical, environmentally-sensible public transit systems. Most people should not need to own cars. Most people who own cars should not need to use them for most trips. I see little in this proposal which will help accomplish that goal. The suburbs are too large and their density is too low for all these long miles of suburban track to accomplish any significant change. Most people will continue to drive for most of their trips, because most people still won’t live close enough to a light rail station that it could be a practical default. We get the best value for our dollar by focusing on dense populations of people who have good but not great transit service. Bringing high quality rapid transit to dense urban areas will allow a significant number of the people living in those areas to use public transit as their default, because they will be able to reach work, school, shopping, friends, and most of the other places they need to go via transit. Stretching an already-thin transit network out even further will not tip additional people over the line; it will not free anyone from the need to own a car; it will not enlarge the share of the population who take the majority of their trips by transit. It will merely enlarge the share of the population for whom transit becomes an additional, secondary mode. I don’t care about transit as a secondary mode and I’m not willing to vote for an expensive, decades-long project to build more secondary transit. Seattle needs primary transit, and this proposal isn’t offering much of it. Rapid transit to the suburbs is a waste of money, at best, because the suburbs will never be transit-centric, and it is possibly harmful, at worst, because it may work against the trend toward reurbanization, encouraging more people to move out to low-density peripheral suburbs instead of clustering back into dense urban areas. Rapid transit to the suburbs doubles down on a multigenerational mistake, when we could instead be working hard to make up for that mistake by rebuilding our neglected cities and developing dense, efficient urban cores where public transit can be the default.